This is what everyone sees when they start strolling on Boston's most famous historic shopping streets. Newbury Fine Arts gallery continues to count Sebastian Krüger as one of their favorite artists. Kruger's original paintings and latest printmaking are available at this location. With a staff that hails from art historical education, the gallery has been around for 25 years and is one of the leading galleries in contemporary fine art in the United States. 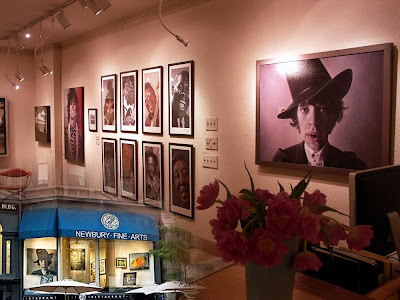 During an enormously successful show with Sebastian in 2006, Sebastian was surrounded with over 100 gallery guests including Stones guitarist Ronnie Wood, Bluesman James Montgomery, Bernard Fowler and Blondie. Artists and collectors alike flocked in to meet Sebastian. Talks of an upcoming event in 2010 are underway. 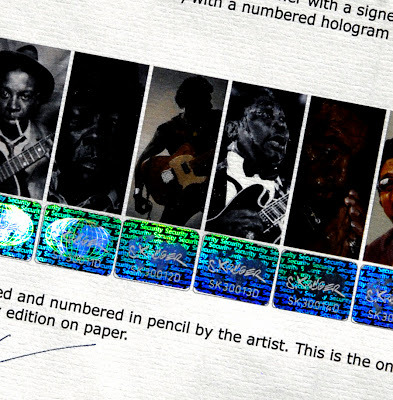 From now on Krüger's new printed limited editions on paper are equipped with numbered hologram labels and a blind embossing for large-sized prints. All corresponding 'Certificates of Authenticity' feature the same product identifications and serial numbers as basis for traceability. The print runs (world edition) for most of Krüger's new limited editions are in a range between 20 and 80. New editions will be published on our blog first.